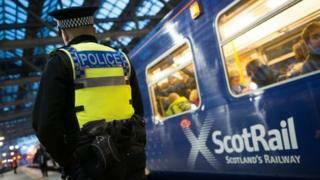 MSPs have passed legislation aimed at merging railway policing north of the border into Police Scotland. The Railway Policing (Scotland) Bill is the first step towards the national force taking on the role of British Transport Police (BTP). There had been a lengthy debate over the plan, with police bosses warning it could be "massively complicated" and "a real challenge". The bill passed by 68 votes to 53, with the Greens backing the SNP. Labour and the Conservatives have opposed the merger and the bill throughout, and the Lib Dems - who had supported the legislation in the stage one vote in order to pursue amendments at committee stage - also voted against the bill. The Scottish government has long wanted to integrate railway policing services into the single national force, and tabled a bill to that end in December 2016. The Railway Policing (Scotland) Bill confers extra powers on the Scottish Police Authority and the Police Service of Scotland, but further legislation would be needed at Holyrood and Westminster to transfer staff, properties and cross-border policing functions. The Scottish government insists the integration will provide "efficient and effective" delivery of policing. However, there has been debate over the plan, with concerns ranging from how cross-border services would be affected to the potential dilution of the special skills of transport officers. The BTP wanted to continue providing railway policing in Scotland, but with oversight from Holyrood rather than Westminster. Chief Constable Paul Crowther warned MSPs that a merger could present a "real challenge" in replacing officers amid a "significant outflow of expertise". However, Police Scotland's Assistant Chief Constable Bernard Higgins told the justice committee the move was not a "land-grab" by his force, saying the transition would be "complicated, but not insurmountable". After a series of votes on amendments during the stage three debate, Transport Minister Humza Yousaf said the "primary objective" of the move was to "maintain and enhance high standards of safety". He said the bill would improve accountability of railway policing in Scotland, and said he remained "absolutely committed" to backing staff. The Scottish Conservatives opposed the plans, with MSP Oliver Mundell describing the merger as "an ill-judged and ill-thought out idea". He added: "The list of those with concerns is almost as long as the Scottish government's list of excuses on policing matters." Labour's Claire Baker also spoke out against the plan, warning of a loss of expertise and saying: "The Scottish government have ignored concerns of staff and unions". Her colleague Neil Bibby, who moved a series of amendments to the bill, said it was "shocking" that the government was "ignoring the views of our police officers". Lib Dem MSP Mike Rumbles said the merger was the riskiest of three options put forward, saying that ministers had decided that the majority of those in the policing sector who opposed the move were wrong. However, Green member John Finnie said his party would support the bill on the condition there was no detriment to staff. The British Transport Police Federation, which represents officers, said they were "disappointed and frustrated" that the bill had been passed, saying the Scottish government had "dismissed" other ideas with "little, if any, discussion". They added: "It is a sad day when politicians interfere with policing in this manner, especially at a time when the country faces such significant threats. "BTP Federation implored the Scottish government to suspend such a decision until the finder detail could be worked through, the cost to the taxpayer recognised and any risk to the railway network and cross-border policing minimised. This request fell on deaf ears and the SNP continued with what can only be described as an ideology around independence. "To our colleagues in Scotland, we are sorry that it has come to this. We tried our utmost to put forward a well-evidenced debate, but it has ultimately been ignored." Commenting after the bill was approved, Justice Secretary Michael Matheson said: "With this move we are ensuring that policing on Scotland's 93 million annual rail journeys is fully accountable to the people of Scotland and our parliament. "We know that preserving railway expertise is vital and Police Scotland have already confirmed their plans to maintain a specialist railway policing function within the wider service. "Making this change gives our railway officers access to the specialist resources of the UK's second largest police force including, crucially, counter-terrorism capabilities."